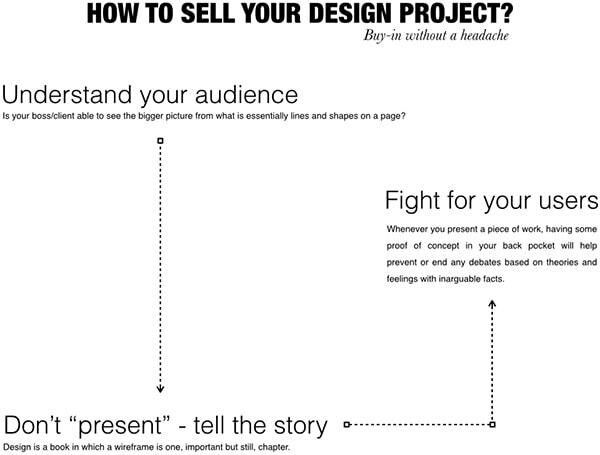 How to Sell Your Design Project? Before I co-founded UXPin – The User Experience Design Platform I spent years working as a full time UX Designer and UX Manager. Excitement of the creative process was mixed with the stress of getting through the infamous buy-in procedure and, often, the harsh feeling of rejection. Showing your first design for a new project can quickly go from being exciting experience to being a very frustrating experience. Believe me. You have all of these great ideas going through your head, a vision that will make everyone praise your skills. But before you start celebrating you need to make sure that your ideas are practical and will resonate with your boss or client. Just one unintended reaction or piece of feedback can completely derail your vision. So when and how do you share your rough design (usually expressed as a wireframe or interactive prototype) with your boss or client to keep your vision alive? How do you get the feedback you need to deliver that awesome design? The most challenging part of deciding when you should show your boss or client the first wireframe in your project is understanding them. How do they process new information that they are presented with? Unfortunately, this may take a little bit of trial and error. Is your boss able to see the bigger picture from what is essentially lines and shapes on a page? Or do they focus on the small details that won’t be addressed until you have put together a complete mock up? If your boss is the later, you may actually want to wait until you have a higher fidelity wireframe to show. This way you can appease their concerns for the small details and prove that that you do have a vision for those details in mind. Including just a couple of these details may be beneficial for a client that is hyper focused on the little things so you don’t get to distracted giving explanations for concepts you haven’t fully worked through. Another element to consider is whether or not they have trust in your ability. Are they hands off? Or do they expect to be involved in every step along the way. In order to develop and keep a good relationship with them, you may want to adjust how often you share your wireframes in a way that appeases and reinforces your relationship. This frequency may need to be adjusted during the duration of the project, just remember to stay flexible and go with the flow. Have you ever told a joke that was hilarious, but no one laughed? For some reason, only you understood why the joke was funny. That’s because you’re connecting dots in your mind with the content differently than your peers. Your wireframe is the same way. It’s a gateway to your larger vision. However, your gateway may not be as transparent as you think it is. You may be blinded by a vision that others may not be able to see, yet. To combat this, present your wireframes as a story. Design is a book in which a wireframe is one, important but still, chapter. That’s why in UXPin you can add personas, business model canvas or upload any document you’d like to be presented alongside your design. Walk your boss or client through the wireframe tying your vision to the overall purpose and story of the project. This will help the project’s stakeholders feel an emotional bond with your design and it’s connection to the overall goals of the project. While your wireframe won’t show them everything, you can fill in these gaps in understanding with their imagination. Ultimately, this will help coax them into seeing your ideas the way you want them to. It’s important to note that you shouldn’t just stand there silently as someone looks over your wireframe for the first time. In those moments of silence they are already establishing unshakable opinions and gathering their thoughts into feedback. Instead, lead them through your design. If you are not present, make sure you are using the right tools that allow you to effectively communicate remotely about your work (like UXPin!). So you’ve studied your boss to know exactly when to share your wireframe and also painted a great picture of your vision, but it may not be enough. Your boss is probably concerned that some of your concept won’t resonate with customers and will not increase their company’s revenue. It’s easy for a client or a business leaders to let fear take over. Resulting in a desire to revert to something that fits nicely into yesterday’s status quo. We’ve all done refresh projects that have had our visions squashed with the deliverable not looking much different from the original. So how do we make sure that our great vision, which your boss is already emotionally connected to, takes off? The answer is simple, provide a proof of concept. Have others done anything like this before? Have you conducted any user testing to prove your assumptions? Whenever you present a piece of work, having some proof of concept in your back pocket will help prevent or end any debates based on theories and feelings with inarguable facts. Backing up your design decisions with data, telling a story and understanding your audience are the foundations of presenting your wireframes like a champ to ensure that your vision thrives. ps. 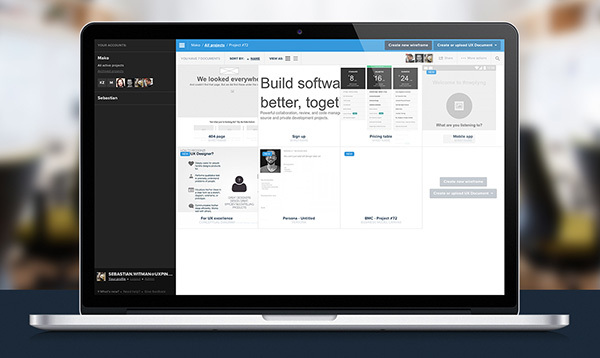 You can sign-up for a free trial of UXPin and start telling design stories right away!